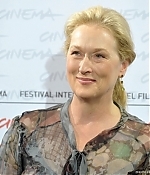 Meryl has arrived in Italy today for the 4th Rome International Film Festival. She has attended the photocall for “Julie & Julia”, an interview session, and, just a few hours ago, the gala premiere for the film. Over 150 pictures have been added to the Image Library with much more to follow.